According to the latest Gallup’s latest global employment survey only 13% of the world’s workers are fully engaged. Unfortunately, traditional resources are doing little to improve these numbers. In fact, they are getting worse. How on earth can we create engaged workers if we do not show them how to change? Inspired Work has identified that our ability to change is directly tied to our ability to engage. We know this is so because we have been instilling the experience and the skills of positive personal change since 1990. What is The Workplace Engagement Solution? 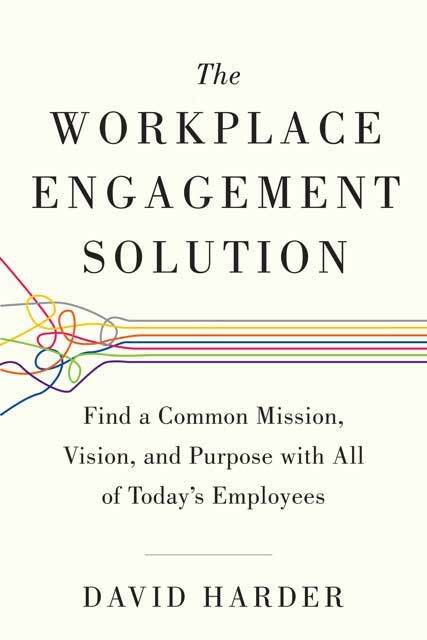 It is a book and an organizational process that builds employee engagement form within. Inspired Work treats engagement as a characteristic that requires equal accountability with all members of the team, from the entry-level employee to the CEO. In it, David Harder examines how the root of engagement is based at the individual recognizing and learning how to successfully respond to change on a continuing basis. The book is inspired by the results from thousands of participants coming through our programs and affecting deep personal change as well as improvements throughout their careers. Many of these participants came together as intact teams where engagement numbers improved dramatically. Inspired Work is no stranger to leadership-focused programs. In fact, the organization redesigned Disney’s leadership program in 2001. But, leader-based programs are out-of-touch with the needs of today where we need to develop the capacity within every employee to lead their own lives effectively. Currently, employee disengagement is treated as a chronic condition with enormous consulting fees and ongoing challenges. We propose that an organization can develop self-sufficiency around employee engagement by teaching people how to change and engage. Engagement grows through mentorship-driven cultures where employees develop the very abilities that drive connectivity, wakefulness, investment, excellence, and enthusiasm. Building an engagement culture is straightforward and outlined clearly in the book. Also, every option in the following progression will make complete sense. Always feel free to reach out to Inspired Work to discuss appropriate early steps that fit your organization’s needs and culture. Provide a copy of The Workplace Engagement Solution to every employee. This step helps talent become used to the concepts, expectations, and learning experience to come. Give the Inspired Work Program to at least one intact team. The program provides a game-changing “jump start” to engagement personal and collective levels. Introduce a pilot program or series of programs within your organization. Inspired Work partners with organizational leadership in designing a comprehensive Workplace Engagement Solution. We design a culture change program that fits the organization’s needs, CEO values, existing resources, and, of course, the available budget. The life skills required for the new workplace, the skills that underpin engagement are clear and straightforward. Inspired Work develops scalable and “right-sized” methods to help clients develop effective internal skill building resources or to provide outsourced learning programs. Developing a self-sufficient engagement culture requires the development of a highly effective internal mentoring process. Our team includes mentoring specialists that have served a wide-range of employers ranging from small start-ups to large, multinational organizations.